I’m amazed at the number of disappointed lower middle class friends who have become enraged against Obamacare and their taxes raise to the point of being blinded to the very accurate depiction of Trump you are about to read. It seems that no matter what we write or fact check or analyze, we only contribute to making this buffoon more popular. I had to laugh about Renford compares Donald to an albatross! Over here we tend to see him as a duck…. Unc’Donald Duck!!! Only that this isn’t funny and terribly preoccupying! “The lack of conservative decency and civility created Trump” and will remain as a symptom of our day and age. So while the Republicans are left to analyze their madness on the “thorny bed in which they will now have to take a four-year nap” (from Ren’s mouth to God’s ears…and I write this on Yom Kippour, so with a satellite connection 😉 )here is how the mad rise of Trump is explained to the world in awe by this remarkable Professor of Political Science. Food for thought on our holiest holiday! The second presidential debate proved that Donald Trump is still defiant and still serious about being the president of the United States. But the revelation of Trump’s crude and crass talk about sexual assault undermined any realistic chances of Trump stepping into the Oval Office. He is now a liability for the Republican Party. 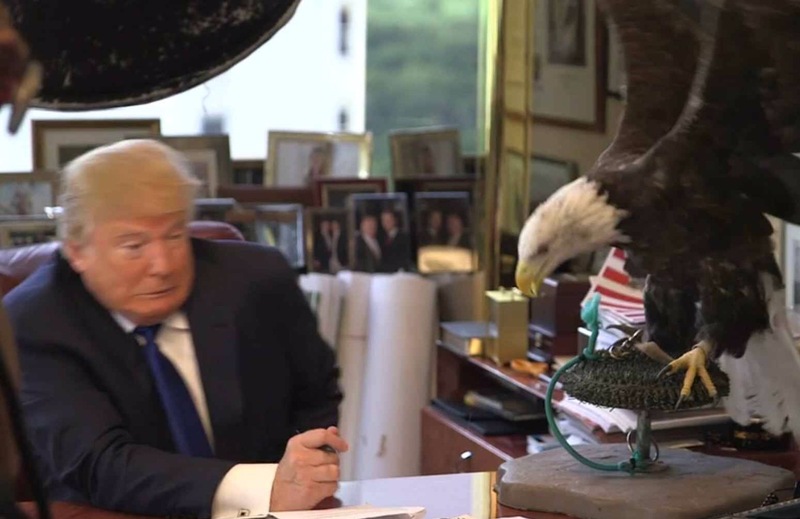 In fact, Donald Trump is an albatross that Republicans created. They created him by being the “anti-party”: anti-immigrant, anti-black, anti-Muslim, anti-LGBT, anti-climate change, anti-compromise, anti-Obama, etc. They created Trump by letting a handful of media personalities control their agenda. They let these radicalized conservative ideologues inspire them to embrace the ugliest elements of our society. Conservatives have allowed the Rush Limbaughs and Sean Hannitys among us to hijack their party. And now they are on the verge of pushing their party off a rugged cliff. One of the best moments of the second presidential debate came at the very end when the candidates discussed one of their opponent’s positive attributes. At some point in our lives, we have all learned to compromise. We have learned to tell our colleagues, friends and family when they are right and when they are wrong. We have learned that none of these people is wrong all the time. And we understand that decency compels us to moderate our own views and tolerate the views of others. The lack of conservative decency and civility created Trump. Conservatives have spent almost eight years spewing an unprecedented amount of hate toward President Obama. In their eyes, Obama has done nothing right; he is wrong 100 percent of the time. This unrelenting anti-Obama sentiment created Trump. Obama’s character is beyond reproach. He is a dignified statesman and an exemplary leader who has exuded the qualities that we expect in our president. Indeed, Trump is the anti-Obama. The conservatives’ hate for Obama drove them to the anti-Obama. Perhaps if they had moderated their anger toward the president and could acknowledge the good and the bad of his presidency, they would have cultivated a different type of constituency to appeal to for this presidential election cycle. But hate begets hate and the mob mentality of Trump supporters has simply overwhelmed the Republican establishment — the same establishment that helped create the mob that it now cannot control. Republicans should know that in life and in politics, you reap what you sow. Indeed, it is ironic that Republicans are now making self-serving moves to distance themselves from Donald Trump. The reason this is ironic is because Trump has been Trump throughout his adult life: bigoted, sexist, racist, xenophobic and ill-informed. My question to those who have just jumped onto the “Replace Trump” bandwagon is: Why dump Trump now? By acquiescing to Trump’s hate over the past few months, Republicans sold their souls to the devil and now they are in a tailspin of seismic proportions. The Republicans who support and supported Trump up until recently have done a disservice to their country and to their political party. And the groupthink phenomenon has proven itself again to have terrible consequences. This embarrassing episode is less about Trump the demagogue than it is about the masses of people and Republican leaders whom he was able to manipulate and bamboozle. What does this tell us about Paul Ryan, John McCain, Mitch McConnell, Ted Cruz and others? What does this tell us about the evangelical Christians among us? In what way has Trump represented their core values and beliefs? In what ways has Trump reflected the teachings of Jesus? For Republicans, what should have been a presidential election that was a gift from the political heavens has turned into a nightmare. If you live long enough, you come to realize that what goes around truly does come around. With egg on their face and the taste of grape Kool Aid in their mouths, Republicans are in the midst of the most colossal political crisis of the modern era. They have created a thorny bed in which they will now have to take a four-year nap. Renford Reese is a professor in the Political Science Department at Cal Poly Pomona and a contributor to this blog from its creation. Not only is he a precious friend but also the brillant author of eight books and the founder/director of the Prison Education Project. His papers on can be found at a page dedicated to his unique and inspirational perspective, just click on the link! Just spent the evening making Vote Clinton phone calls to my native state of Arizona. Whoo-whee!! Brings back memories. The good news is that most of the folks I spoke to are voting for Hilary. The sad news is that those voting for Trump are doing so with a kind of Cormac McCarthy, “No Country for Old Men” (old white men) vengeance. I felt like I was speaking to one of my old cowboy stepfathers a couple of times. But the women, save for one, were all clear as a bell voting for Hilary. One woman was so sad, depressed and undecided; non-plussed with both of them, that I felt ashamed on her behalf. The most heartbreaking call was a woman whose son is in the hospital dying from cancer. He was voting for Clinton and she wept on the phone as she told me about her son’s condition. We spoke for awhile. She said the whole family was voting for Hilary. I told her I was voting for her son getting through the next few weeks and sort of didn’t care who won as long as her son gets better. Life is precious and far, far more valuable than the outcome of a presidential election…unless, of course, the outcome of an election can actually save and care for more lives than not. Complicated times. It was good to be engaged in the process as opposed to just posting on FB. indeed… semer la haine et on récolte la tempête dont on n’a encore rien vu. car quel(le) que soit le vainqueur, d’une part le parti républicain est mort et de l’autre tout va changer. ceux qui ont soutenu Trump tout en se bouchant le nez (ou pas d’ailleurs) veulent une “Restauration”, un “avant”, quand les femmes n’avaient pas les mêmes droits, sans parler des minorités. Mais tous, Démocrates ou Républicains ont laissé tomber une large partie de la population américaine et la facture arrive. Tout à fait d’accord….on a le diagnostic mais pas le traitement de choc…Nous nous enfermons dans un égoïsme confortable en jugeant ceux qui en bavent…comment sortir de ce cercle très vicieux…?